Several organizations reporting on higher education issues have estimated a significant gap in the college completion rates of the low-income students who receive federal Pell grants and other college students, leading some to question the effectiveness of this investment of taxpayer dollars. 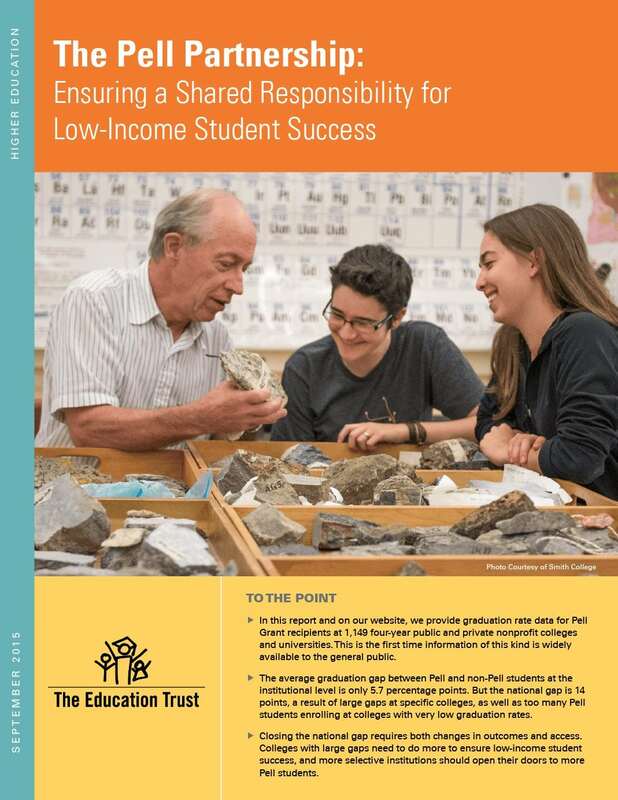 But, according to The Pell Partnership: Ensuring a Shared Responsibility for Low-Income Student Success and online data tool, the average graduation gap between Pell and non-Pell students at the institutional level is actually much smaller: only 5.7 percentage points. And more than a third of four-year colleges and universities have even smaller gaps or no gaps at all. These data deliver a powerful blow to those who question whether taxpayer dollars are being wasted or whether most low-income students are even capable of completing college. This is great news — but unfortunately the story doesn’t end there. Written for policymakers, researchers, students and their families, The Pell Partnership gives a full view of Pell Grant graduation rates at nearly 1,150 institutions, including an analysis of the national completion gap and best practices at institutions that are serving low-income students quite well. The paper and accompanying materials provide something these stakeholders have waited far too long for — easily accessible information on how well our nation’s colleges and universities enroll and graduate their low-income students. Andrew Nichols, director of Higher Education Research and Data Analytics shares highlights from our latest Education Trust Report on Pell Grant recipients graduation rates. Check out the full report to see which colleges and universities are doing their part to ensure low-income students succeed, and which ones are not.